Can I edit the message list to remove spam, etc ? PG Offline without Yahoo ID? Local messages & Web messages? "Error : The HTTP redirect request failed"
"Error : The server name or address could not be resolved"
Q. Can I edit the message list to remove spam, etc ? A. Yes. You can use the Search and Sort facilities to find unwantedmessages in the message list. Then use the Delete function to get rid of them. Q. I am seeing the message 'Error: You were locked by Yahoo' when I try to download groups. Typically this happens after I have downloaded 10000 - 20000 messages. A. Yahoo limits the activity of individual users by logging hits on their server from your IP address. 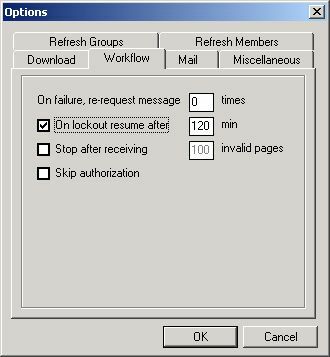 Once you have fully downloaded your group & are only doing regular refreshes this wont be an issue. 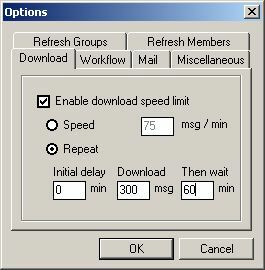 perform a 'download, wait, repeat' cycle. This functionality is available from File--> Options --> Download. request messages after it has been blocked. PG Offline automatically detects the locked out condition & can be set to automatically resume a download after a user defined period. Q. Can I use PG Offline without a Yahoo ID? A. No. You will need both a Yahoo ID & a current membership for any group you wish to download or import as a file. Q. I left my laptop on overnight to download groups & I came back in the morning to a Blue Screen! A. Switch off your power saving mode. Your laptop powered down the hard disk while PG Offline was still running. Q. The number of 'Local messages' & 'Web messages' does not tally on some groups. A. This is correct. Some groups, particularily the bigger groups may have either archived off earlier messages or particular messages may have been deleted by the group moderator. This leads to discrepancies between the highest message number and the actual number of available web messages. Q. How does PG Offline handle duplicate attachment filenames? A. PG Offline handles attachments by generating random strings & adding them onto the name along with an identifier for duplicates. The format of this is : (original name)-(five digit random number) so a duplicate of 'image001' might become 'image001-12345'. Q. What should I do if I see "Error : The HTTP redirect request failed"? A. The Yahoo groups service is busy. Try your download again later. Q. What should I do if I see "Error : The server name or address could not be resolved"? 1. You are running a Firewall & you have not given PG Offline permission to access the Internet. 2. You are not connected to the Internet... check your modem & wiring. 3. Your ISP's DNS server is down... contact your ISP. 4. Yahoo's servers are down... wait & try again later.